There are so many food brands being sold these days and with so many recalls cropping up lately it can get a little overwhelming to make an informed decision. The dog food market is packed with low-quality and overpriced foods that triggers food allergies as soon as you feed it to your pet dog, and frankly aren’t worth a fraction of what you paid for. Fortunately, we’ve done all the research on the best dog food for Chow Chows and narrowed it down to five high-quality premium dog foods so you can decide on the right Dog Food Brand for the best value. If you’re in a hurry check out Blue Buffalo Life Protection Recipe. This is the best rated Chow Chow dog food, because it is rich in protein, low in fats and calories and contains no by-products, corn, soya or artificial colors or preservatives. With the myriad of commercial dog foods on the market, it can be difficult figuring out between the different brands and also which ones offer the most nutrition for your Chow. We took a look at 2019's Top Food Brands & their Best Recipes and carefully researched their ingredients and overall nutritional value. Blue Buffalo is a great choice since it provides your Chow with all the nutritional requirements it needs as an adult. Widely regarded as a leader in the natural pet food industry this formula is protein-rich featuring deboned lamb and menhaden fish meal as primary protein sources along with brown rice and other wholesome grains which are easy for Chows to digest. This healthy and holistic recipe is also packed with fruits and veggies for complete nutritional balance. In addition, this blend also includes the exclusive LifeSource Bits (the small dark kibbles mixed with the food) a proprietary blend of vitamins, minerals and antioxidants that helps maintain a healthy and strong immune system. Plus because this an adult formula, you can rest assured that it will provide your Chow with the protein (crude protein 22%), fat and caloric requirements he needs to remain strong and healthy while leading an active lifestyle. Because the Chow Chow has a thick double coat, aside from the lean protein meats this recipe also contains Flaxseed and Chicken Fat – natural and healthy sources of Omega 3 and 6 Fatty Acids to help promote a shiny coat and health skin. This recipe contains NO chicken (or poultry) by-product meals, NO corn, wheat or soy and NO artificial colors, flavors or preservatives. A great food option for dogs with allergies and sensitive digestive systems with only 377 kcal/cup. We think this recipe could be a good choice for adult Chow dogs! 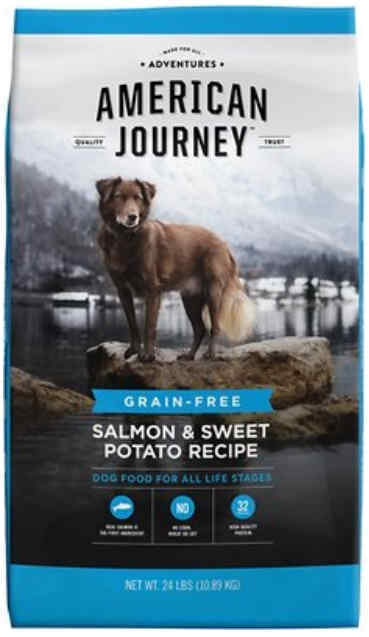 Our #2 pick for the best dry dog food for Chow chows is American Journey's grain-free fish diet. The Salmon & Sweet Potato recipe is high protein, gluten free and contains no soy, corn or wheat. Deboned salmon is the first ingredient and is a very rich source of quality protein that helps build and maintain healthy muscle tissue, is plentiful in Omega fatty acids for healthy skin and coat and a source of glucosamine and chondroitin for joint health. Chicken meal and turkey meal are the second and third ingredients - and while you may think these are inferior to fresh meat, think again. Chicken and turkey meal is just fresh meat cooked to remove moisture and in fact contains more protein than fresh chicken or fresh turkey. This food has 390 kcal/cup, so not high in calories and a good option if your Chow Chow is struggling with weight issues. As we mentioned this dry kibble, is high in protein and contains min. 32% crude proteins, 14% crude fats and 5% crude fiber. Finally, sweet potato and chickpeas make up the fiber and complex carbs in this recipe which are easy on a Chow's sensitive digestion. Dogs on American Journey fish diet have enjoyed healthy coats and skin, firmer and regular stools and clearing up itchy skin. On top of that, it's a favorite with picky eaters, it's an all life stages recipe suitable for all dog breed sizes and very affordable whether you have one or multiple dogs regardless of age or breed. Currently Chewy are running a special discount on all American Journey recipes- buy 1 get 1 free only available at Chewy. Our #3 pick for the best Chow dog food is Solid Gold’s High Protein with Duck recipe which is both grain-free and gluten-free. What separates it from its other recipes is the high protein content which is a whopping 38% featuring duck, chicken meal and turkey meal as the main protein sources and its first three listed ingredients. This is an extremely versatile recipe specially formulated for active adult dogs hence the higher protein content. The high quality protein meats will give your Chow dog the strength and energy it needs on a daily basis. This recipe is gluten and grain free, so it won’t trigger allergies and digestive issues like other dog food brands. 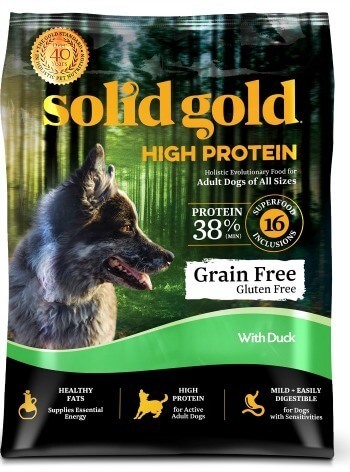 Solid Gold High Protein with Duck uses a blend of 16 superfoods to make sure that your pet dog is getting everything he needs for a balanced diet. These superfoods include carrots, apples, blueberries, pumpkin, cranberries, and broccoli. Solid Gold is also fortified with Omega 3 and 6 fatty acids from ingredients such as Whitefish Meal and Flaxseed to make sure dogs maintain their skin and coat health. While only slightly more expensive than our #1 pick, Solid Gold Holistic High Protein is a great alternative premium dog food for active Chow Chows featuring higher than average protein levels than found in other foods and packing in just 345kcal/cup. 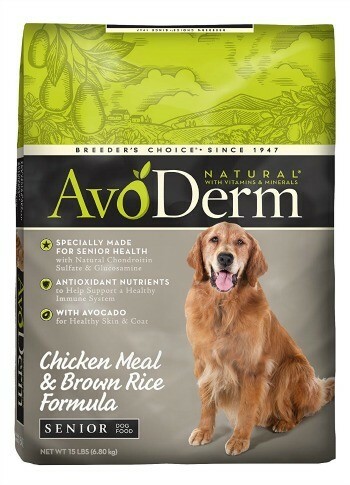 AvoDerm﻿﻿ Chicken Meal & Brown Rice Senior ﻿﻿﻿Dog Food is specially formulated for aging dogs since it contains natural chondroitin, sulfate and glucosamine essential for senior health and healthy joints in big dogs. Protein is the first ingredient in this recipe featuring chicken meal followed by easily digestible whole brown rice which Chows do so well on. The list of ingredients is very impressive which further underlines this brand’s focus on using natural ingredients: Oatmeal, Rice Bran, Chicken Fat, Avocado, Flax Seed, Chicken Cartilage, Alfalfa Meal, Herring Meal and an array of added minerals and vitamins, with 340 kcal/cup. The use of avocado is an excellent and healthy addition which will help keep your Chow’s skin and coat healthy. We highly recommend AvoDerm Senior Natural Dog Food for aging Chows. This recipe has also proven to be beneficial to dogs with sensitive skin and other allergy problems since it avoids the use of corn, wheat, soy and animal by-products. Overall, this recipe could be the perfect choice for your older Chow Chow. As the proud owner of a Chow puppy, you are indeed right to be concerned about whether or not your pup is getting the nutrients he or she needs. FROMM is a family owned artisan pet food manufacturer well regarded for formulating superior quality dog foods. 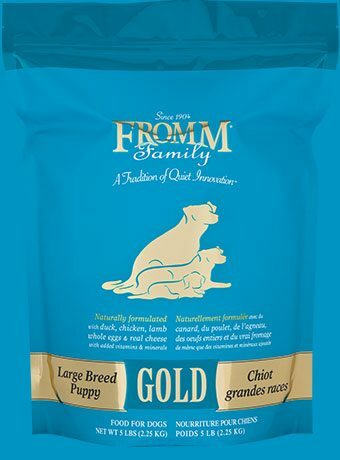 Fromm Gold Large Breed Puppy formula is considered by pet nutritionists to be the best puppy food for dogs that grow to more than 50 lbs which is a great puppy Chow food option. This blend is made with premium proteins such as: fresh duck, chicken, lamb, whole eggs and real cheese. The formula contains 26% protein and 14% fat (great low-fat weight management factor) and is fortified with probiotics for digestive support. Completely sourced and manufactured in the US, this reasonably priced formula continues to receive the best rating for nutritional value, natural ingredients which minimizes food allergies and overall taste. With no recall history and a long-term presence in the dog food industry Fromm uses quality products which means your puppy will get the best in nutrition. We think this puppy recipe is a top rated Chow Chow puppy food option for your growing bundle of fur. Unique characteristics: one of the oldest of dog breeds. Chow Chows are fluffy dogs with fur around their necks that resembles a lion’s mane and an adorable face that resembles a bear. Hailing from Asia, this is considered the oldest dog breed in existence and has been used as a working dog, show dog, and companion for many years. Because of their thick fur, Chow Chows are perfect dogs for owners who live in cold, Northern climates. Despite their appearance, Chow Chows are not particularly cuddly dogs, but they do many great companions to their master and are laid back dogs that will come to love their whole family. Chow Chows are moderately active dogs that need a good trainer, and like any other dog they need good food with natural ingredients to support a happy and healthy life. Chow Chows, like most dog breeds, should be fed a diet of natural whole foods along with lean protein meats as the primary component to help maintain their energy and optimal health. At least 20% and more of a dog’s food should be comprised of protein. Their thick double-coat means that the food you choose has to help maintain healthy skin and coat. Since hair is 65-95 percent protein, look for high quality dog food brands with correct proportions of highly digestible proteins. A recent study in the Journal of Nutrition (2014) showed that a diet high in protein (at least 47.5%) and low in carbs promotes weight loss. This high-rich protein blend can also help tackle your Chow's weight if he is overweight. However a rich protein diet shouldn't be fed to Chows that have pre-existing kidney issues. Also bear in mind that these diets should be conducted with the help of your vet and shouldn't be used long-term. Fats are another necessary ingredient in a Chow’s diet since they provide energy, insulation and help maintain and promote shiny coats. Keep fats between 10-15%. Carbohydrates are another vital nutritional component in your Chow’s diet since they are excellent energy sources and when found in fiber it helps with digestion and waste elimination. Last but not least, vitamins and minerals are important components since either a deficiency or excess in either can be detrimental to your Chow’s health. Seek foods high in vit. A, E and fortified with minerals Calcium and phosphorus. Chow Chows can be fed once a day (preferably in the evening) or twice a day (once in the morning and once in the evening). It is important that whatever is decided, the owner sticks to a schedule to ensure their Chow is getting the best nutrition possible. Since dogs like humans enjoy regularity, owners should make sure to leave out their food only for a while, in the same place and at the same time and be careful not to free feed them. Free feeding them can lead to weight gain, causing joint issues and other health problems for a Chow Chow. Dogs should also always have a clean bowl of fresh, cool water available to them especially if you feed them a dry kibble diet. Assuming the average Chow dog weighs between 40 and 60 lb., then an average adult weighing 50 lb. will require to consume around 1350 calories a day to help support good overall health. Puppies should be fed three-four times a day but no less than two meals a day. When selecting commercial dog foods for your Chow puppy, feed a formulated﻿﻿ puppy food﻿﻿ ﻿﻿recipe until he is 18 months old since this is the most critical growth stage of a dog’s life. A 7-10 month old Chow Chow puppy will need more calories than an adult Chow to encourage growth and assuming a weight of 25 to 40 lb. the typical caloric requirement is between 1650 to 1980 calories a day. Senior Chows will require less calories since they are less active. Aging dogs put on weight more easily which puts a strain on their internal organs and considerably shortens their lifespan, so seeking the right senior dog food for your older pal is key. You may also want to consider reducing their fat intake since aging dogs find it harder to digest and is high in calories. The best way for owners to make sure they are giving their dog just enough food is to measure it out and go from there. The amount can always be adjusted later based on a Chow’s individual needs and activity levels. Since Chow Chows are not major exercisers, they most likely won’t need to eat as much as other dogs their size. Since Chow Chows can suffer from joint problems, so owners should keep them on a diet of premium dog food with added ingredients like glucosamine and chondroitin to support joint health. Since a Chow Chow's weight when not carefully supervised can lead to obesity this only worsens his joints. It's important that aside from watching his diet he also gets a daily dose of gentle exercises. Some Chows are protein sensitive which leads to skin rashes and digestive issues, so owners may want to consider switching from chicken to lamb or fish. This can greatly minimize Chow Chow food allergie﻿﻿s since some dogs can find it difficult to process certain proteins like chicken for example. 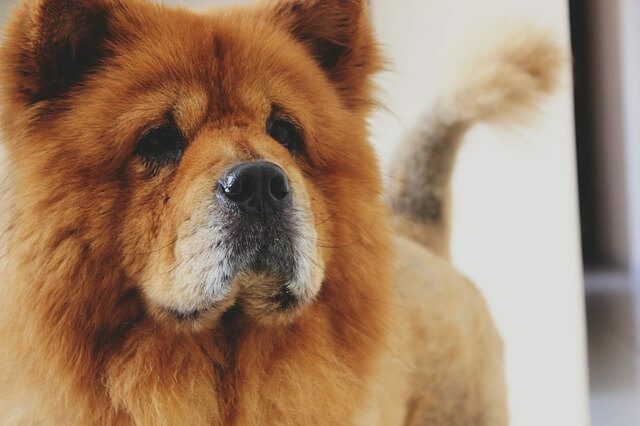 Since Chow Chows have a thick double coat, it is also important to feed them a dog food with ingredients like Omega 3 and 6 fatty acids to support their skin and coat health. If your chosen food lacks these you can use a supplement with your Chow's diet of either Salmon, Oil, Cod Liver Oil or Flaxseed Oil. If you're in doubt about how to find the best dog food for Chow Chow breed, your best bet is to consult a vet for more information. Best Brand of Food for Chinese Chow Chows? There are a lot of quality dog food brands out there, however these four are our top picks because of their nutritional value and ratings. 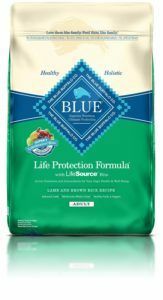 Blue Life Protection: Lamb & Brown Rice and Solid Gold High Protein with Duck are great, high-protein options that focus on dogs’ complete nutrition. These blends are also recommended for dogs with allergies and digestive issues since only the highest quality ingredients are being used. Since each brand has unique special feature think about your Chow’s needs and then click to buy the one you deem best!